View More In SCSI Cables. 3 High Quality Solid Capacitors on each card for reliable and safe power delivery. 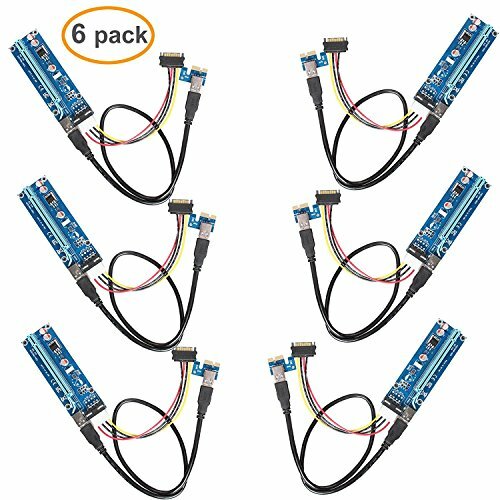 4-Pin MOLEX to 15-pin SATA power cable for direct connection to your power supply reduces the power burden on your motherboard and ensures maximum compatibility with your power supply. No drivers needed to install. 4 Holes For attaching the riser card to your rig. Warranty Limited Lifetime Warranty and Lifetime Product Support Please contact us if you are not satisfied with the item after receive it, we will give you a satisfactory solution before leave Negative Feedback or Customer Reviews. Your satisfaction is our greatest encouragement,Thanks for your support to our new store. Version 006 Riser Kits Are The Perfect Solution For Setting Up Ethereum Mining Rigs (Or Any Other GPU-mined Altcoin ), whether small open air rigs or large rack based miners. 3 High Quality Solid Capacitors For Reliable And Safe Power Delivery. 60cm USB 3.0 Riser Cable enabling Flexibility In The Placement Of Your PCI-E Devices. If you have any questions about this product by LINESO, contact us by completing and submitting the form below. If you are looking for a specif part number, please include it with your message.